To adjust the brightness of the display for an iPod classic, choose Settings→Brightness. The Brightness screen appears with a slider that shows the brightness setting, which ranges from low (a quarter-moon icon) to high (a bright sun icon). Scroll clockwise to increase the brightness (toward the bright sun) and counterclockwise to decrease the brightness (toward the moon). To adjust the brightness on an iPod nano, tap Settings→General→Brightness from the second Home screen. The Brightness screen appears with a slider that shows the brightness setting, which ranges from low to high. Slide the brightness slider’s knob with your finger to the right to increase the brightness (toward the bright sun) and to the left to decrease the brightness (toward the dim sun). Of course, the brighter the screen, the more power is drawn from the battery. On an iPod nano’s Brightness screen, tap Restore to Default to set the brightness back to its default setting (a bit dimmer than half). You can also wallpaper your iPod nano screen with one of the built-in wallpapers: tap Settings→General→Wallpaper, and then tap a wallpaper design. 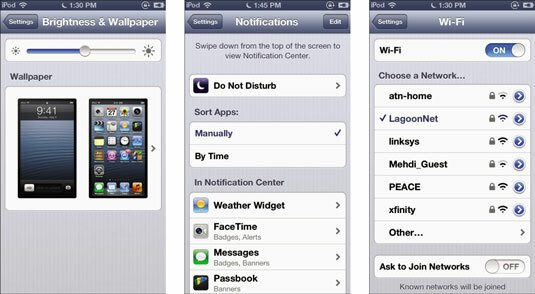 To adjust the brightness of an iPod touch, tap Settings→Brightness & Wallpaper. The Brightness & Wallpaper screen appears with a slider that shows the brightness setting, which ranges from low (a dim sun icon) to high (a bright sun icon). Slide with your finger to the right to increase the brightness (toward the bright sun) and to the left to decrease the brightness (toward the dim sun). While you’re at it, why not wallpaper your display? You can make your iPod touch display different stylish wallpaper backgrounds for your lock screen and Home screen — one wallpaper image appears on the lock screen, and another appears behind the icons on your Home screens (or you can use the same image for both). You can also put up photos or other images from your Photo Library as your wallpaper choices. On an iPod nano, you can set a colorful pattern as your wallpaper on the Home screens. You set the wallpaper on an iPod touch the same way as setting brightness: Choose Settings→Brightness & Wallpaper from the Home screen. To see the menu of wallpaper options, tap the combined lock screen and Home screen thumbnail that appears below the Wallpaper heading. On the wallpaper options menu, you can choose from among stylish built-in wallpaper images by tapping the Wallpaper button at the top. To choose from the photo library you synchronized with your iPod touch, tap a photo album. You can instead choose photos captured on the iPod touch by tapping Camera Roll, or photos in your photo stream by tapping My Photo Stream. On an iPod touch, tap the thumbnail of a wallpaper image to select the image for your wallpaper, or tap the Back button in the upper-left corner to return to the Wallpaper menu. After tapping a wallpaper image thumbnail, the Wallpaper Preview screen appears; tap Set to set the image as your wallpaper or tap Cancel to cancel. If you tap a thumbnail of a photo, your iPod touch displays the Move and Scale screen, which lets you optionally pan the photo by dragging your finger, and optionally zoom in or out of the photo by pinching and unpinching with your fingers. Tap the Set button to set the image as your wallpaper or tap Cancel to cancel. After setting your image, a menu pops up with the Set Lock Screen, Set Home Screen, Set Both, and Cancel buttons. Tap Set Lock Screen to use the image for the locked screen, tap Set Home Screen to use the image for your Home screens, or tap Both.